Heat a small amount of olive oil in a pan and saute’ leek until soft, add curry powder and cook for 1 minute, set aside. Place chickpeas in a food processor bowl and roughly process, transfer to a medium bowl, add leek mixture to chickpeas and add the remaining ingredients. Mix thoroughly. Shape into 12 burgers using a 1/4 cup measure. Heat a pan on medium heat and spray with a small amount of olive oil, cook burgers on each side until golden. 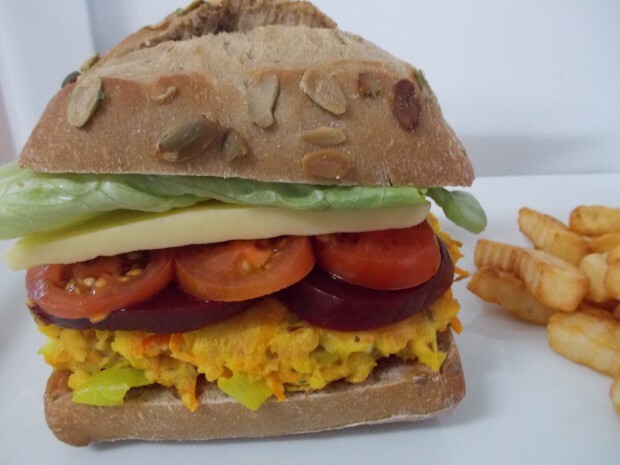 For a delicious satisfying main meal serve burgers in between a fresh multi-grain roll with lettuce, tomato, beetroot, cheese and topped of with home made tomato chutney.